Christina and Anthony both teach high school science for the York Catholic District School Board, in York, Ontario. When Christina was transferred to teach at the same school as Anthony, the two met and quickly became friends. As things between them started to progress, Anthony took the next step and asked Christina out for coffee. The two have been inseparable ever since. White, cream, pink and gold were the designated colours for Christina and Anthony’s wedding. Courtesy of Royal Orchid Florist, all of the décor, flowers, linens and romantic lighting left the reception area of the Embassy Grand glistening. The wedding party table, styled like a King’s table, had white drapes hung behind with chandeliers fashioning flowers. 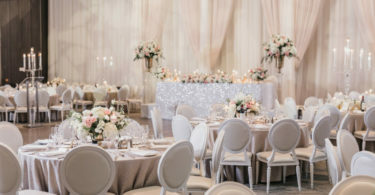 For the 440 guests, tables with tall candelabras and large displays of flowers were set, as well as pink and white plush antique styled chairs and sofas. Set in the middle of the dining hall was a stunning circular bar, complete with trees sprouting from its centre, with branches lined with orchids. 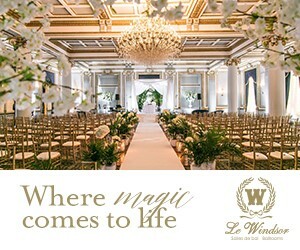 Find this wedding in the June 2015 issue of Toronto’s Elegant Wedding Magazine.